I remember when I first got to Alaska. It was the culmination of a lot of idealistic dreams of a mythical place where certain things happened a certain way. And I wasnâ€™t disappointed. I took pictures of everything, many of which I still refer to fondly. Somewhere along the way, the salmon runs, the gold, the extreme weather, the $500 one hour plane ride to Anchorage, the post-reality-TV-stardom- all became a yawn. And then this German living in Switzerland contacted me. At first: I am so sorry for my bad English, itâ€™s only school-English and I donâ€™t use it so often. You certainly ask yourself, why this guy writes me? My name is Jens, I am 32 years old. I was born in Germany and since over 4 years I live in Switzerland and work as a nurse at the Emergency. I dive since a lot of years (only in the red sea of Egypt, Africa) and I am a Hobby-Gold-Miner. My dream is, I can connect both hobbies. In July 2017, I travel to Alaska and yes, I travel to Nome!!!! Do you need for 1 or 2 days help on your Sluicita? I would also NOT have money for my help. For me, it is an adventure. I would be very happy about a positive feedback. I love English second language speakers. Iâ€™ve done business with China, and I love reading those emails about, â€œwe looking forward to happy cooperation!â€� Where the grammar and syntax fails, the actual person and motivations shine through even brighter with their literal translations of what they really want to say. Well, his due date arrived, I was in town, and I offered him a spot on my couch. He got off the plane, and his enthusiasm was infectious, even for a â€œtired-of-this-old-townâ€� grouch like myself. I gave him the tour, and everything was â€œWow!â€� and â€œCool!â€� But his accent pronounced it, â€œCoowahl!â€� in a delightfully deliberate diction. We quickly got into politics, then religion. He helped me with some equipment I was working on, and he bought me a Subway sandwich, which we took 5 miles out of town to my cabin under construction. I alternately called him Jens or Germany. As we ate, I showed him the cabin. â€œTheese is what I want! Theese is purrfect!â€� He gushed. And, when I started the cabin, it was what I wanted too. I placed it on the gravel pad so it faced a river valley without a single cabin in sight. Just wild, Alaska. We sat down outside to finish our meal, and reclined in my recycled chair, admiring the view which I hadnâ€™t taken the time to admire in awhile. That night, I set up a hide-a-bed couch for Jens. But I was dog-sitting a 30 pound lady sled dog in heat for the first time, and a 100 pound male German Shephard who was neutered but still capable of handling things. Needless to say, it was a busy night, and Jens ended up top-bunking it in the bunk room where there was some peace and quiet. 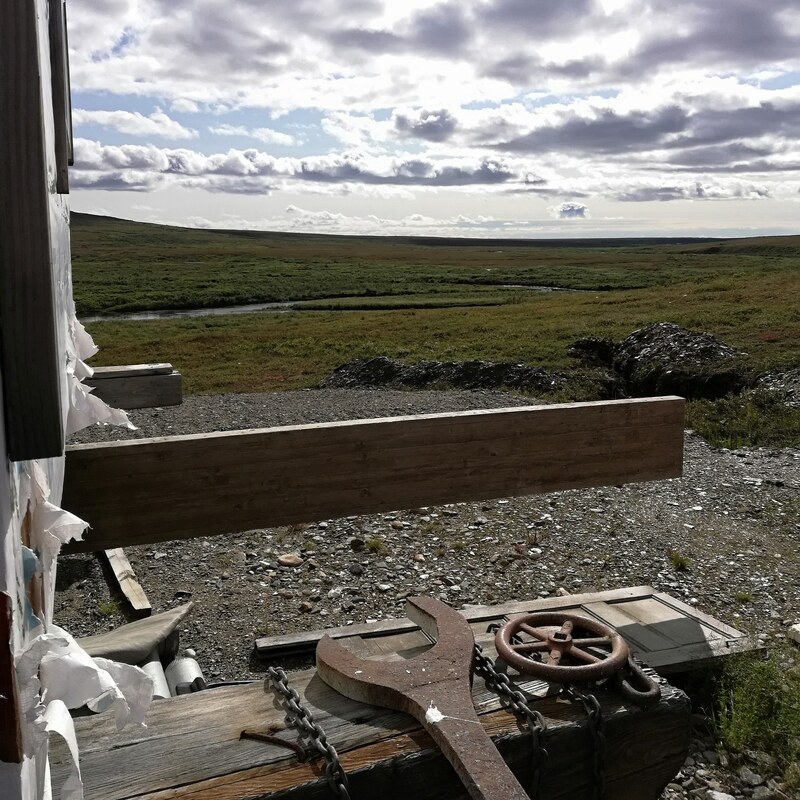 The next day, I put together a skiff, motored Jens out to my friend who was gold-diving, and he spent the afternoon on my friendâ€™s dredge- completely making his Alaska tour. He came off the water gushing about the dredge, and the ocean, and Ah-las-kah! Coowahl! Wow! It was hard not to smile. That night, on a whim, in broad daylight at 11pm, we went to the river. The pink salmon were running. And there are salmon and SALMON, and pinkâ€™s are the former. Having eaten enough salmon now to be a little bit of a snob about it, (enough of a snob to not bother ordering salmon in lower-48 restaurants (lower-48 being another term that was hard to explain to a German not familiar with the concept)), I wasnâ€™t especially disappointed when we didnâ€™t catch anything. â€œWe didnâ€™t actually fish. We just threw metal in the water and pulled it back outâ€� I corrected playfully. â€œYa, but its still purrfect.â€� Jens reaffirmed. My inner-dialogue asked itself, â€œis your life nothing more than work-fish-sleep? What else should there be. ?.â€� Still working on this question. I envied Germany for having found an answer. I envied Germany for his envy of my perfect life. Another bunk room night of dogs in some form of flirtation. A simple breakfast cooked on a cast-iron pan. Then work. Jens helped me all day, then as we were going to take a road trip, my friend Bill came over to use my sluice box to clean the gold out his gravel concentrates. Jens came to Nome to see gold, so the road trip was abandoned. After the clean-up, we took a gander back to the river, where we didnâ€™t catch one, or two, or three, but six salmon in the course of an hour. We filleted them, and put a couple in the pan, and an hour after swimming, Jens had the freshest salmon heâ€™ll have in his life. I took Germany to the airport Sunday morning. Heâ€™d happened to visit during a rare, 3-day stretch of sun in mid-summer. Beaming. Glowing. Made his year. Made-his-life kind of visit. Leaving the airport, I reflected on my new friend Jens, and my life in Nome. On all the extraordinary things that have become ordinary. â€œCoowahl!â€� I said to myself.